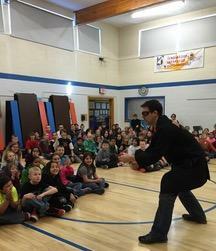 Billings Senior High School chemistry teacher and STEM Society faculty advisor Craig Beals show students at Newman Elementary how to shoot ping pong balls using chemistry. “We created STEM Society as part of a 5 year plan to increase enrollment in our upper divison science classes,” says Beals. 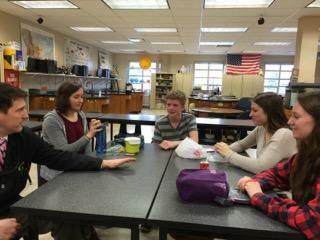 STEM Society got its start in the 2014-15 school year. Beals worked with the Senior High football coach to develop the criteria to earn the letter in science. One way the STEM Society does that is by mentoring other students. Recently 14 STEM Society members brought the magic of science to students at Newman Elementary school in Billings. Students in grades 3-through-6 sat cross-legged or on their knees on the gym floor. They squealed and clapped as the high schooler’s lit soap bubbles on fire, made water “disappear” through chemistry, or demonstrated principals of physics. 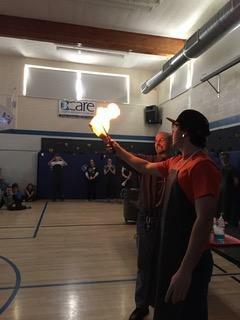 Newman Elementary School Principal Travis Niemeyer looks on a member of the STEM Society lights his hand on fire. Niemeyer dipped his hand into soapy water infused with methane gas. “To date, I have not heard of anything like the STEM Society that they have there,” says Angela McLean, a deputy commissioner in the Office of the Commissioner of Higher education. Among her duties is K-12 partnerships with the Montana University System. The former high school teacher from Anaconda also worked on encouraging more students to take science and math classes in school as Governor Steve Bullock’s former lieutenant governor. Tom Cubbage is a biology teacher at CMR High School in Great Falls and the president of the Montana Science Teachers Association. He says many of his peers have STEM programs, but none he says are like Senior High’s STEM Society. State School Superintendent Denise Juneau praises the program, especially for its community involvement that emphasizes teaching younger students. The STEM Society is poised to issue its first letter this school year. The members are finalizing what it will look like, but they think it will be shaped like the atom pin their faculty advisory Craig Beals wears on his black lab coat.